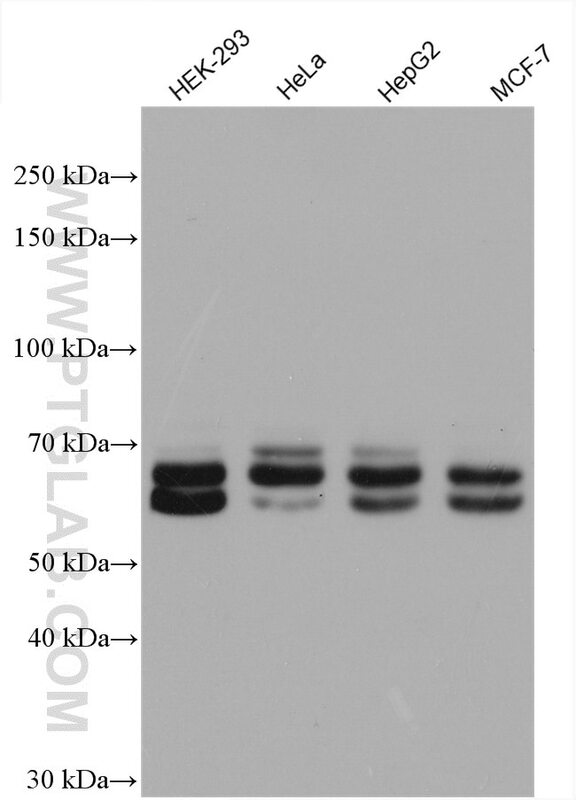 WB result of KEAP1 antibody (10503-2-AP, 1:2000) with si-control and si-KEAP1 transfected HEK293 cell. 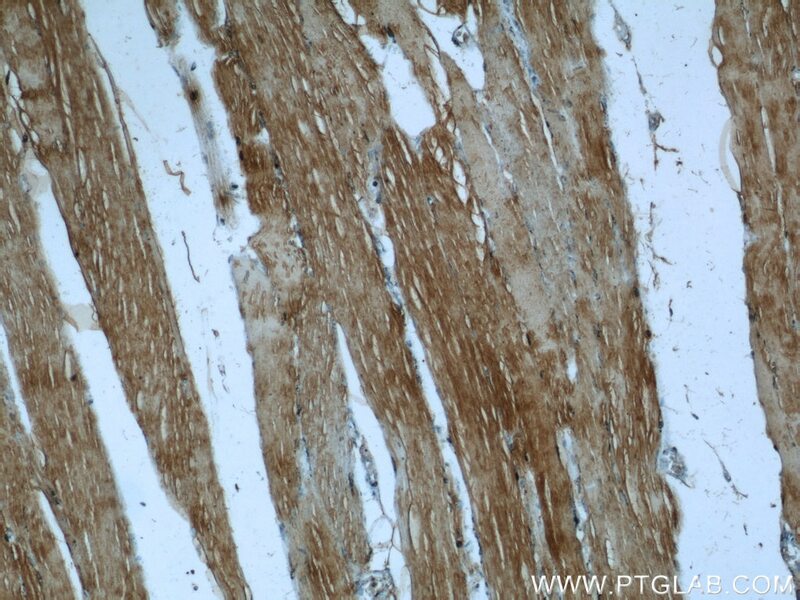 IP Result of anti-KEAP1 (IP:10503-2-AP, 5ug; Detection:10503-2-AP 1:600) with mouse skeletal muscle tissue lysate 8000ug. 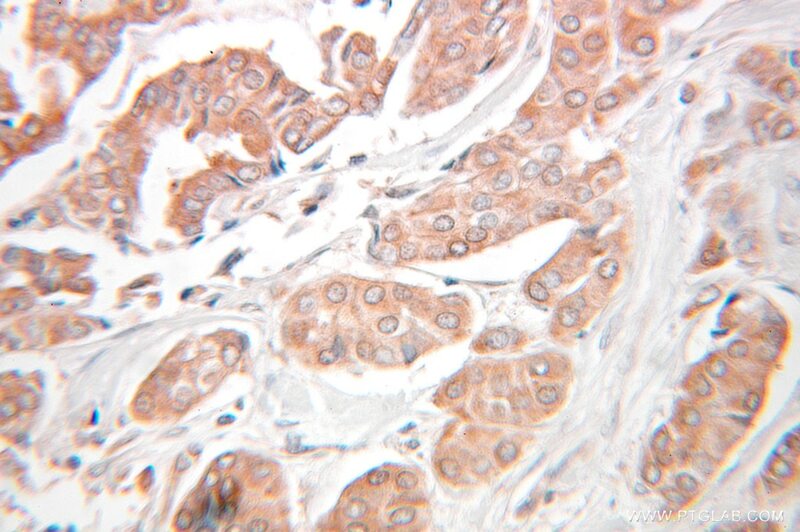 Immunohistochemical analysis of paraffin-embedded human lung cancer tissue slide using 10503-2-AP( KEAP1 Antibody) at dilution of 1:200 (under 10x lens). Kelch-like ECH-associated protein 1 (KEAP1) is a negative regulator of nuclear factor erythroid 2-related factor 2 (Nrf2), a transcription factor governing the antioxidant response. What is the molecular weight of KEAP1 protein? Are there any isoforms of KEAP1? The molecular weight of KEAP1 protein is 70 kDa. The KEAP1 gene gives rise only to protein isoforms, but mutations of KEAP1 protein have been found in various cancer types. What is the subcellular localization of KEAP1? KEAP1 resides in the cytoplasm, where it binds to Nrf2, targeting it for degradation and preventing translocation of Nrf2 to the nucleus. How does KEAP1 control Nrf2 levels? Is KEAP1 post-translationally modified? KEAP1 is rich in reactive cysteine residues, whose thiol groups play a role in binding to CUL3 and the polyubiquitination of Nrf2, which leads to degradation of Nrf2 via the proteasome system. During oxidative stress, electrophiles and reactive oxygen species (ROS) modify the KEAP1 thiol groups, reducing the affinity of KEAP1 to CUL3 and the stabilization of Nrf2. Nrf2 then translocates to the nucleus, where it binds to the antioxidant responsive elements (AREs) and induces the expression of antioxidant proteins (PMID: 16354693). 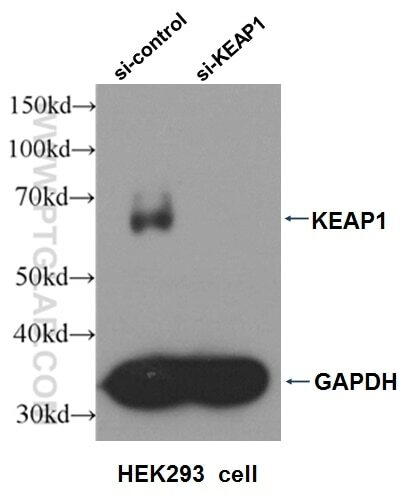 Under basal conditions (unstressed cells), a detectable KEAP1 protein level is observed. Oxidative stress modifies KEAP1 protein activity by increasing the Nrf2 protein levels. 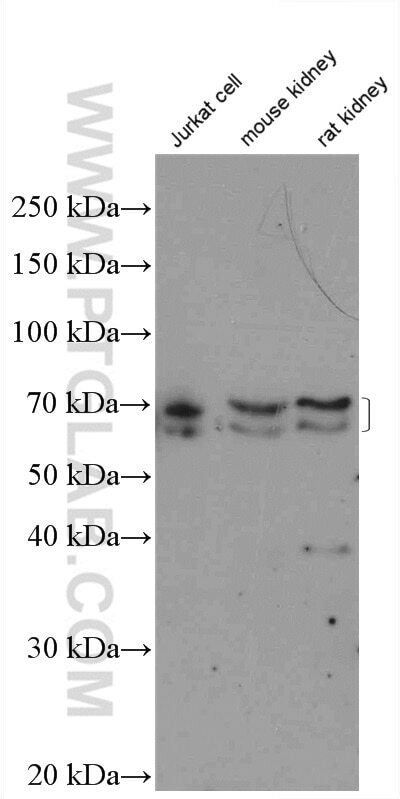 This can be measured, for example, using western blotting (PMID: 27697860). KEAP1 protein levels are not altered by oxidative stress. What is the role of the KEAP1-Nrf2 pathway in health and disease? The KEAP-Nrf2 pathway plays a vital role in redox homeostasis and cryoprotection. Inhibition of KEAP1 activity leads to the activation of Nrf2 and increase the response to oxidative stress and anti-inflammatory effects (PMID: 29717933). The activation of Nrf2 can be beneficial in the case of metabolic diseases, such as diabetes, as well as neurodegenerative diseases such as Parkinson’s and Alzheimer’s diseases. 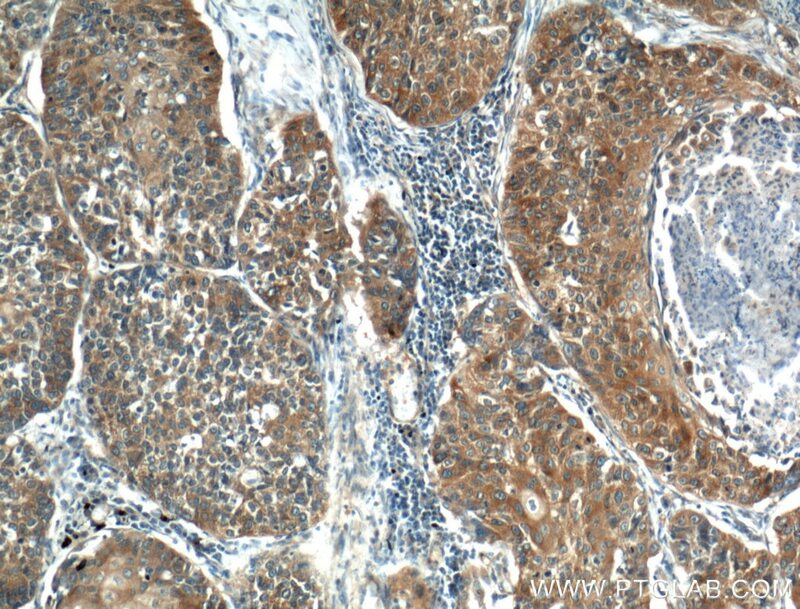 However, the increased activation of Nrf2 is also known to promote tumor growth and metastasis. 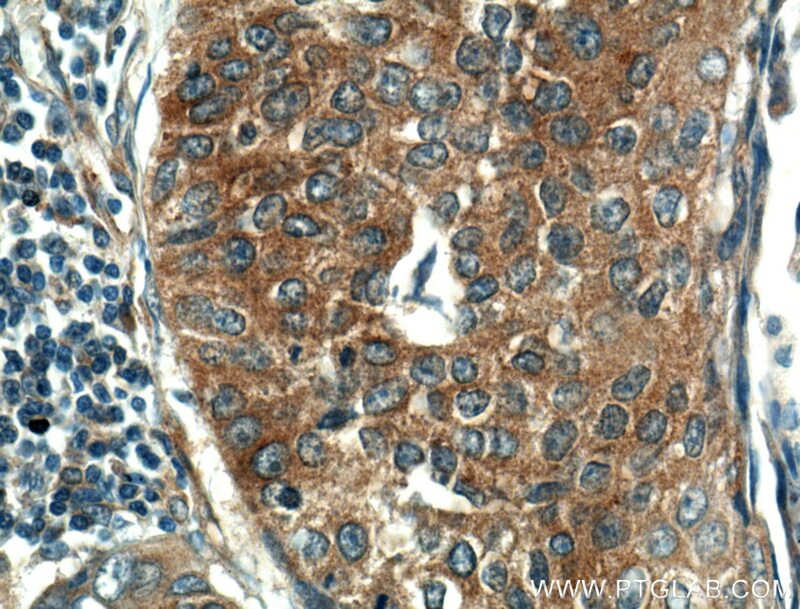 Mutations in both KEAP1 and Nrf2 were found in various solid tumor types. A doublet band appeared at the correct size and this was the only band that appeared on the blot. We did not perform genetic knockout/expression to confirm the specificity of this band, however it appears correct. 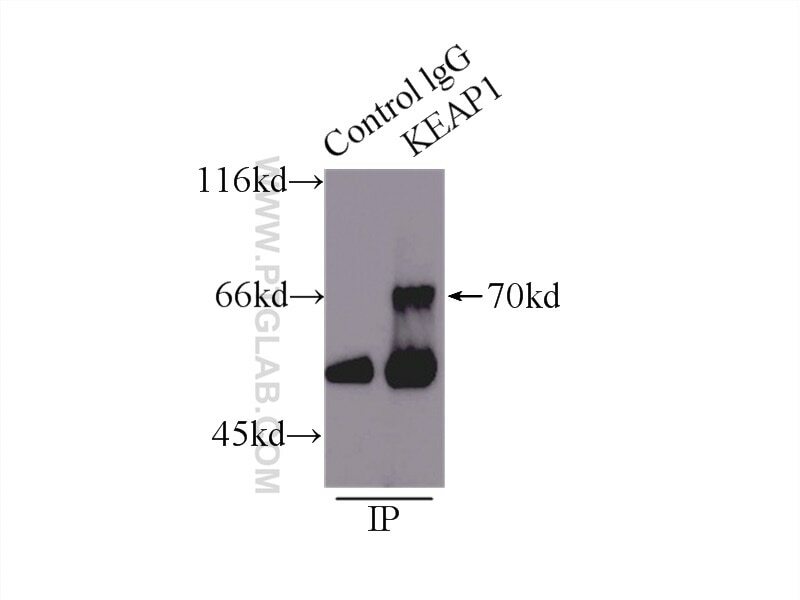 Keap1 regulates inflammatory signaling in Mycobacterium avium-infected human macrophages. Double Knockdown of PHD1 and Keap1 Attenuated Hypoxia-Induced Injuries in Hepatocytes. miR-432 Induces NRF2 Stabilization by Directly Targeting KEAP1. 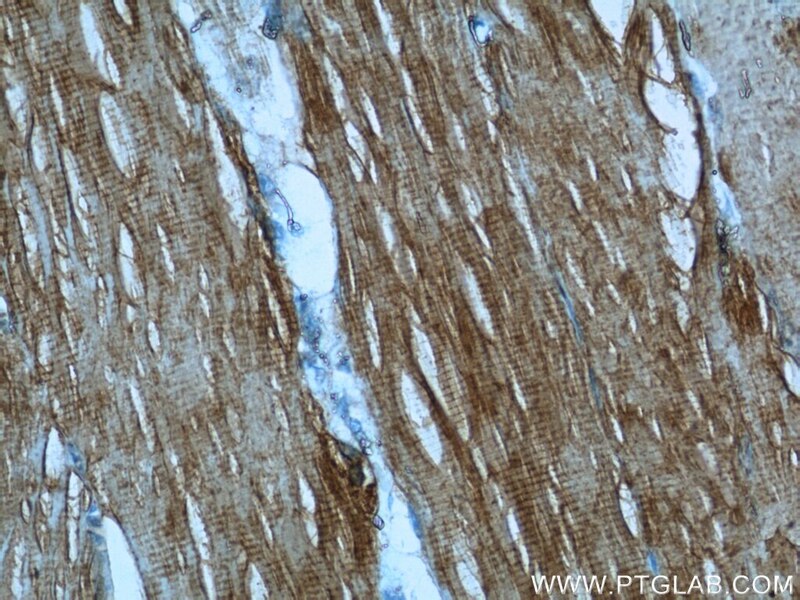 Immunohistochemical analysis of paraffin-embedded human lung cancer tissue slide using 10503-2-AP( KEAP1 Antibody) at dilution of 1:200 (under 40x lens).